YipTel delivers the most powerful, easy to use applications that will deliver time and money savings to your business. YipTel Desktop offers powerful desktop software that delivers: User Presence, Softphone, Instant Messaging, Video Calling, Voicemail, and more from one easy-to-use application. 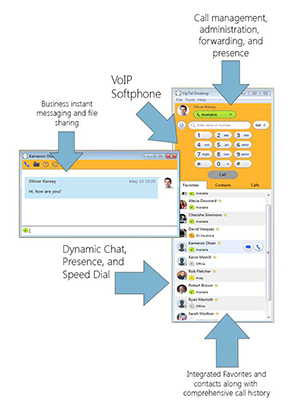 The YipTel Desktop Client firstly delivers a complete VoIP softphone. Included with the ability to call from the client without any hardware attached, are continuous call archives, call recording options, transfer, hold, park, and conference. Our powerful desktop client offers the ability for users to see co-worker’s availablility when they are at their desks, away, in a meeting, on the phone, and offline. These easy-to-use status icons are dynamic with your phone and operating system. You can additionally manage this information via the same client or through our login portal shown on our website. Experience the improved productivity that comes from instant messaging and file sharing with YipTel desktop. Starting a chat session with another co-worker is as simple as clicking an icon next to their name. Along with presence comes the ability to click-to-call in addition to archived copies of your chat history with each contact added in your portal. The desktop application also allows you to manage your incoming calls and routing behavior with easy access to control Simultaneous Ringing, Find Me Follow Me, and Custom Greetings or routes. This allows you to be in complete control of your calls and to better connect with your clients and coworkers. Voicemail is accessed. 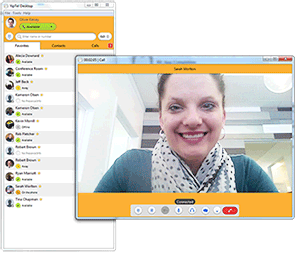 With a USB camera attached to your computer, Video Calling now a reality. Video Calling provides the ability to call from YipTel desktop to YipTel desktop, YipTel desktop to YipTel mobile devices & YipTel Video Phones. Need multi party video? Connect to YipTel Video Conferencing for larger video meetings.